Hello and welcome to the 159th installment of the SWD. 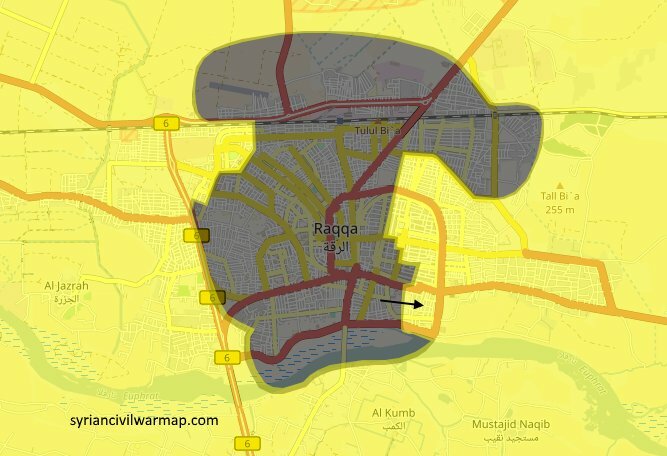 Islamic State launched a counterattack against the Syrian Democratic Forces in Hisham Abdul Malik district, southeastern Raqqa. IS’ attack started with an SVBIED against SDF‘s gathering in the district. Amaq Agency reported death of two SDF‘s fighters and injury of three more, due to clashes with the Islamic State near the Panorama roundabout, the Old Mosque, and Al-Raqqa “Savings Housing”. Hayat Tahrir al-Sham and Ahrar al-Sham reportedly reached a ceasefire in Idlib, according to the latter’s statement. As a part of the ceasefire, Ahrar al-Sham will withdraw from the Bab al-Hawa border crossing with Turkey, and fully hand it over to the civil administration. The two groups also agreed on exchanging prisoners. The Syrian Observatory For Human Rights claimed at least 68 rebel fighters were killed since the infighting began, on the 18th of July. Even though, Ahrar al-Sham and Hayat Tahrir al-Sham reached a ceasefire, the latter captured several localities from the former, such as Atmeh, Babsiqa, Ram Hamdan, Maarat Misrin, and Jabal Shashabo area, overlooking Al-Ghab plain. People of Saraqib held another anti-HTS demonstration in the town, the group is positioned at the outskirts of Saraqib, after retreating from it yesterday due to demonstrations. VBIED targeted the vicinity of Hayat Tahrir al-Sham’s HQ in the southern part of Maarat al-Numaan. Syrian Arab Air Force carried out two air raids over the towns of Al-Rayhan and Douma. Several airstrikes also hit Ain Terma and its surroundings. Syrian security forces seized a vehicle coming from the rebel-held areas in the south towards the Eastern Ghouta, the vehicle was carrying ammunition. Islamic State raided a house in Al-Tabi area, north of Al-Tarmiyah, reportedly belonging to an individual working for the Iraqi National Intelligence Service. Islamic State’s Amaq Agency reported death of the aforementioned individual. Islamic State’s improvised explosive device killed a member of Al-Hashd al-Shaabi (Popular Mobilization Units) and wounded several other fighters, near the town of Amerli (Amirli). Islamic State destroyed a vehicle carrying Al-Hashd al-Shaabi’s elements, on the road towards Al-Waleed (Al-Tanf) border crossing with Syria. Iraqi security forces foiled an SVBIED attack west of Baghdad, as two IS’ elements tried to enter the city. IS’ fighters were arrested and VBIED safely detonated. On the 20th of July 2017 CJTF-OIR has conducted 20 strikes in Syria. CJTF-OIR‘s main focus in Syria at the moment is Raqqa region where they did 16 strikes supporting SDF‘s operations against IS destroying 13 fighting positions, two pipelines, and an oil tank; and damaging a supply route and an IS railway. Other areas where four airstrikes occurred are Abu Kamal (Al-Bukamal), Al-Shaddadi and Deir al-Zour, destroying an IS oil storage tanker, a VBIED, an IS pipeline, an oil tank and an IS-held building, and suppressing a fighting position. Full report on CJTF-OIR strikes conducted in both Syria & Iraq can be found here. Islamic State killed three Filipino soldiers during the clashes in Balang and Marinot districts of Marawi city, according to Amaq Agency.